President Trump’s job approval ratings went up slightly over the past week. 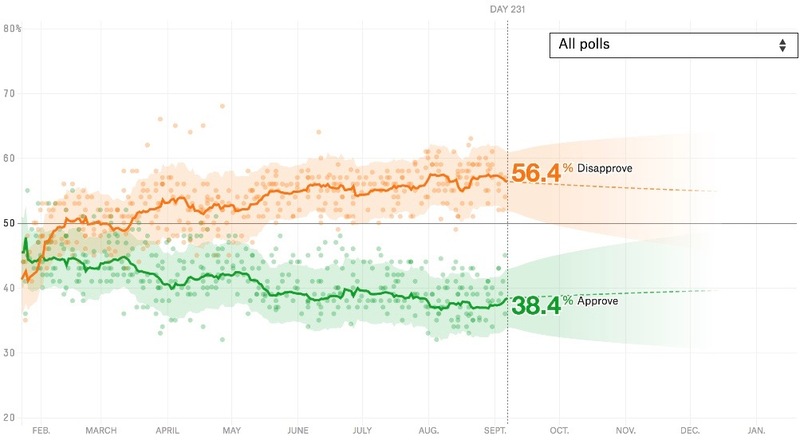 He began the week at 37 percent approve and 57 percent disapprove, and he’s now at 38 percent approve and 56 percent disapprove. The small improvement could be statistical noise, though both the Gallup and Rasmussen daily tracking polls showed the same uptick. Trump may have received a slight boost from the federal government’s largely smooth response to Hurricane Harvey. According to a YouGov poll released this week, 55 percent of Americans approved of the job Trump did in handling the storm. Considering that Trump couldn’t score majority approval on 17 other issues asked about in the same survey, ranging from abortion to terrorism, he has to be pretty happy with his numbers on Harvey. 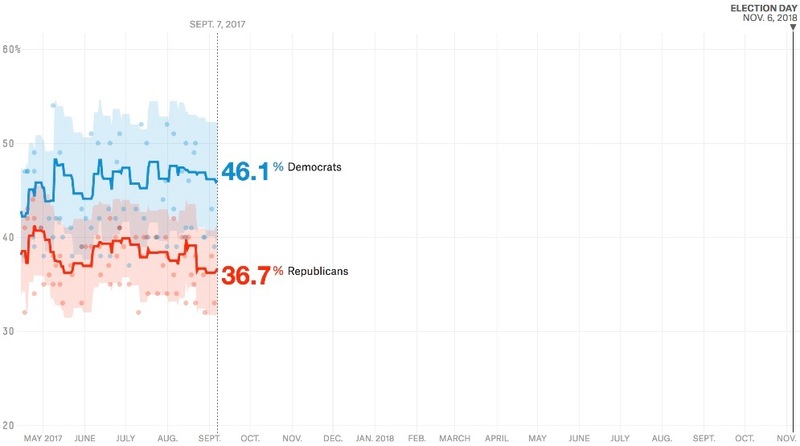 Democrats’ advantage on the generic ballot, 9 percentage points, is up a hair from where it was last week (8 points). The generic ballot is one of the best tools we have for measuring the national political environment. But the real thing we’re interested in is how that environment translates to each individual House seat race. We know from past elections that incumbents tend to outperform the national environment, for example. That’s why — if you’re interested in whether Democrats will retake the House in 2018 — it’s so important to keep an eye on how many GOP representatives retire. More Republican retirements makes it more likely that the large Democratic lead on the generic ballot will be reflected in the number of seats they ultimately pick up. Speaking of: Dave Reichert, the Republican representing Washington’s 8th Congressional District, announced on Wednesday that he will retire at the end of this Congress. His seat becomes a top pickup opportunity for Democrats. Reichert won close reelections in 2006, 2008 and 2010, and the 8th District voted for Clinton in 2016. Later on Wednesday, Charlie Dent, a moderate Republican representing Pennsylvania’s 15th Congressional District, also announced that he wouldn’t seek re-election. That’ll be a good pickup opportunity for Democrats too. We’ll see if these two announcements are aberrations or the beginning of a wave of retirements as GOP members return from summer recess, find the political winds blowing against them and head for the exits. Americans like labor unions — A Gallup poll released at the end of last week showed that more Americans (61 percent) approved of labor unions than at any point since 2003. The poll also found that more Americans (39 percent) wanted labor unions to have more influence than at any point since Gallup started asking the question in 1999. New Yorkers are OK with Confederate monuments — Just 35 percent of New York state voters said that Confederate statues and memorials “should be removed,” compared to 59 percent who said “they should stay up,” according to a new Siena College poll. I suggest clicking through to read the full (and long) question because it’s arguably a little tilted toward the pro-Confederate-monument side. Even so, these numbers are from New York, a dark-blue state. Economic confidence remains relatively high — Gallup’s economic confidence index — a combination of how Americans rate the current economy and whether they believe it is improving or declining — averaged +6 in August. (It’s on a scale from -100 to +100.) During President Obama’s time in office, the index didn’t reach +6 for a whole week (let alone a month) until after the 2016 election. If Trump’s approval rating is as bad as it is now with economic confidence so high, what might happen if the economy goes south? Manchin leads — A new poll conducted by Research America Inc. in West Virginia found Democratic Sen. Joe Manchin leading possible Republican opponents Evan Jenkins and Patrick Morrisey by 10 and 14 percentage points, respectively. Trump won West Virginia by more than 40 points, but it’s also very difficult to defeat incumbents in the opposition party in a midterm election. Trump’s unpopular in Michigan — EPIC-MRA pegs Trump’s favorable rating at only 36 percent in the Wolverine State, where he won by just over 10,000 votes in 2016. It’s possible that this survey is lowballing Trump’s popularity — EPIC-MRA underestimated the Trump vote in Michigan in 2016. But even if Trump is a few percentage points more popular than EPIC-MRA suggests, he’d still be deeply unpopular in a state known for its blue-collar Democrats. That has all kinds of implications for 2020.